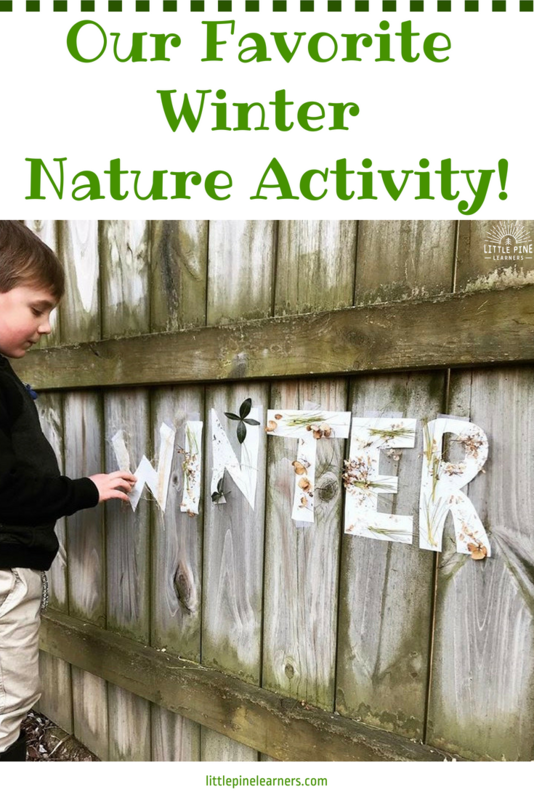 Our Favorite Seasonal Nature Activity! It can be difficult to think of new and fun ways to celebrate the changing seasons. Lucky for you, I’ve got a great idea! 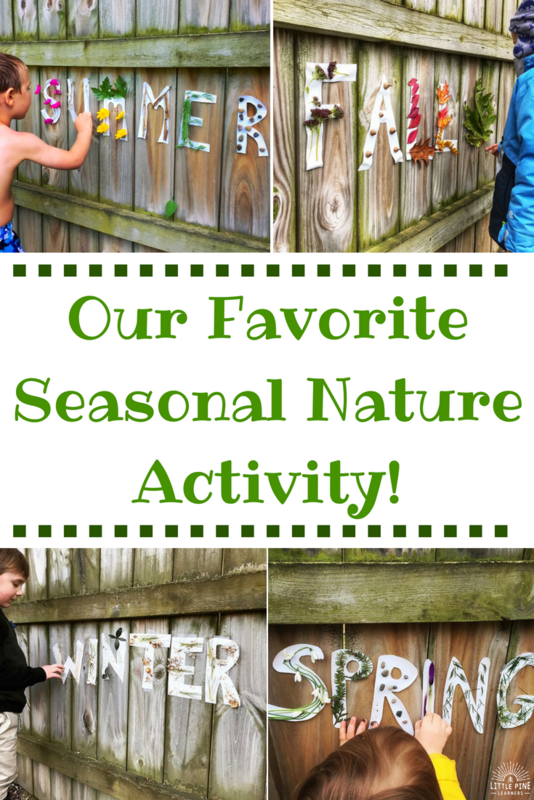 It’s the perfect outdoor activity for summer, fall, winter, and spring! 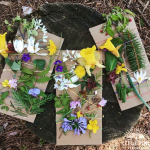 Celebrate the unique qualities of each season with this hands-on and engaging activity. We finally made it through all four seasons with this activity, so I thought it would be nice to share the results right here in one spot! Write the bubble letters of your current season on contact paper. These don’t need to be perfect! I used the grid lines to help guide my way. Once all the letters drawn, cut them out but don’t peel them until you get outside. 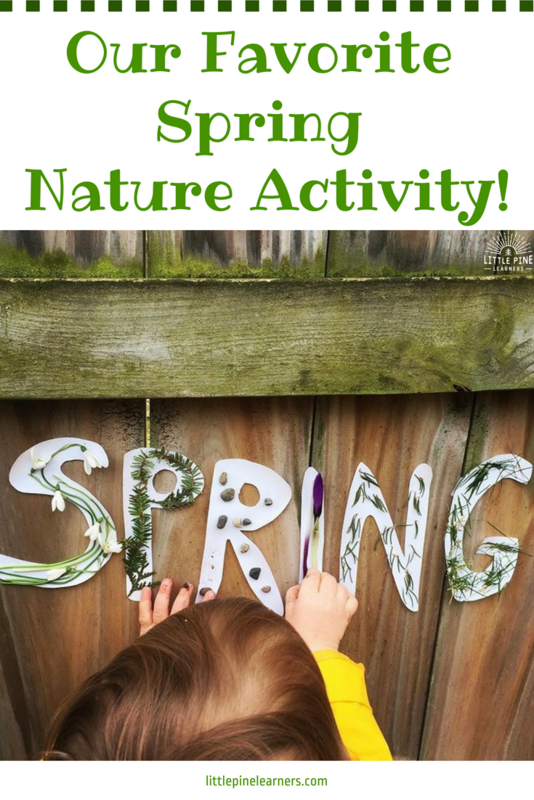 Find a spot outside to display the word. We do this activity on our fence in the backyard. If the weather isn’t cooperating, you can always tape the letters on a wall inside. 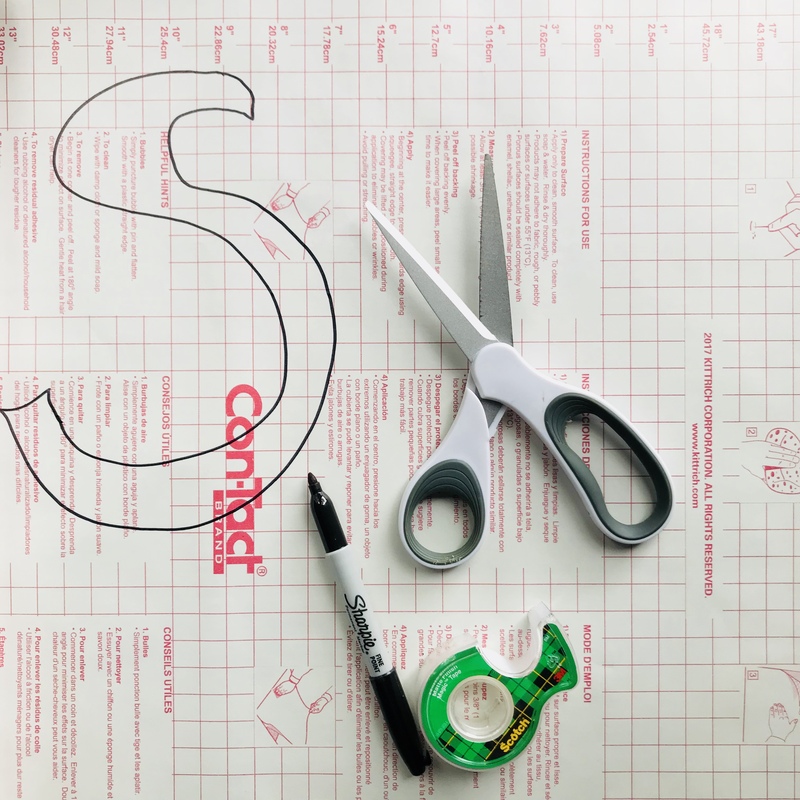 Take the contact paper backing off one letter at a time, sticky side facing out. 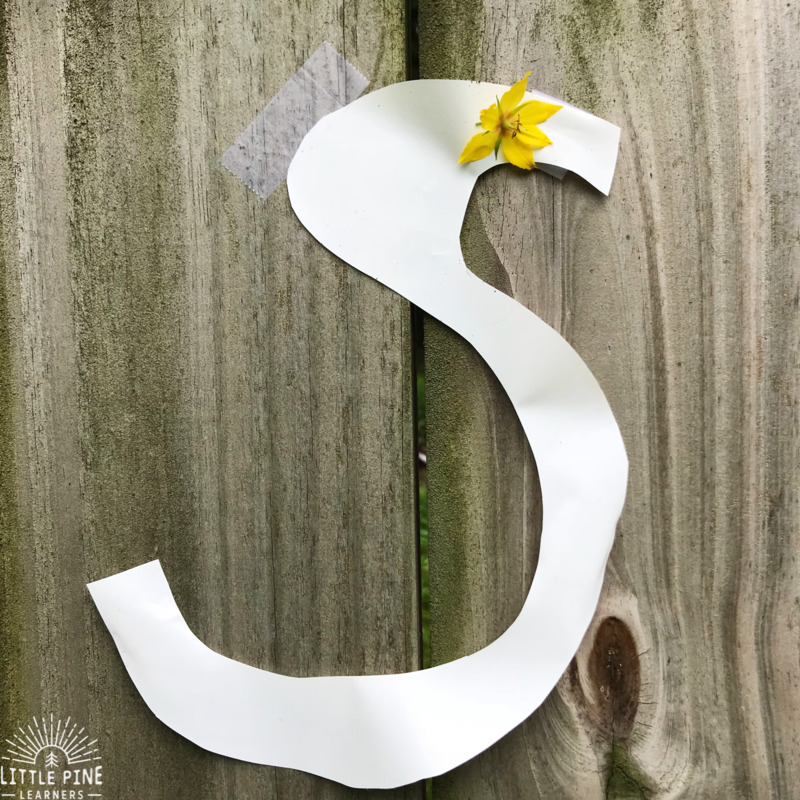 Roll up some tape, put it behind the letters, and put one piece of tape on the letter to secure it to the fence. Continue this process until all letters are taped up. As you search, try to identify as many pieces of nature as possible. Make sure you search high and low and discuss the signs of the season. This is such a fun part of the process! 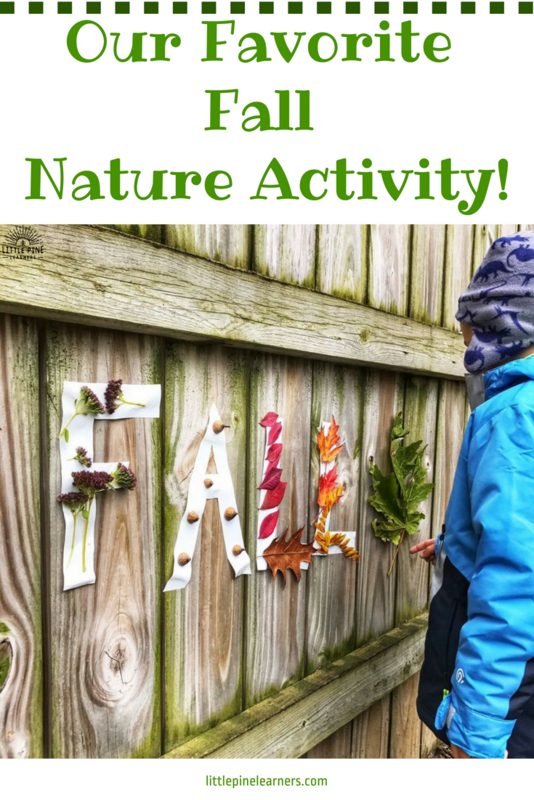 We tied in literacy with this nature activity. As we identified the pieces of nature, we figured out their beginning sounds. If it started with a letter in the word “summer,” we stuck it on that letter. For example, “mulch” and “marigold” both start with “m” so we stuck them on that letter. You can also practice using adjectives! We couldn’t find anything that started with a “u” so we stuck a “unique” plant on that letter. Our fall letters turned out beautiful with flowers, acorns, and leaves! In addition to beginning sounds, we also discussed the beautiful fall colors. There was no shortage of stunning nature finds to display! Winter can be a bit of a challenge due to the cold weather in Wisconsin. We waited for a mild day and headed outdoors for the activity. I thought it would be difficult to find a wide variety of nature, but we were pleasantly surprised to find leaves, pine needles, pinecones, dead (but beautiful) flowers, and other interesting plants. Our letters were really pretty and it was a great excuse to get outside! Spring is such a magical time with new blooms and vibrant greens that take over the landscape. We found snowdrops, pine branches, rocks, irises, pine needles, and fresh grass. The boys were so happy to discover these wonders of nature growing from muddy puddles and slushy snow patches! 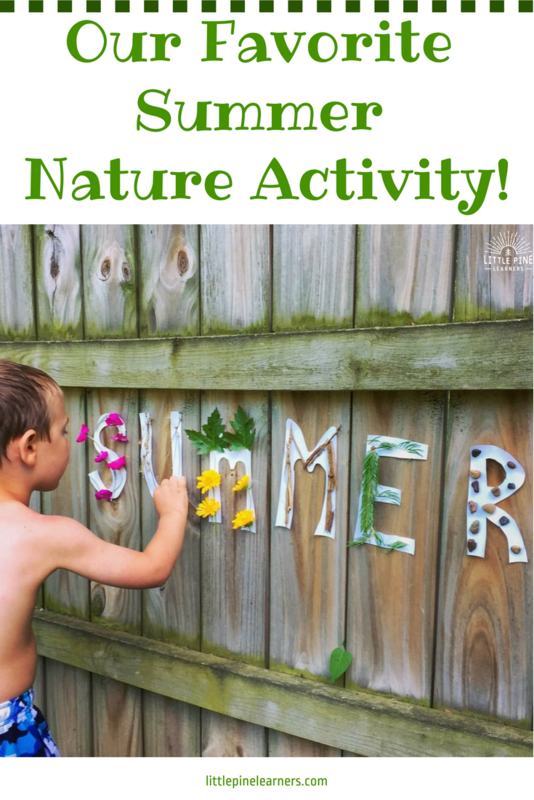 Getting outside and interacting with nature will instill a love for the natural world and the great outdoors! While collecting pieces of nature, try to identify as many pieces as you can. Carry a few nature identification books so you can model how to look up unknown pieces of nature. 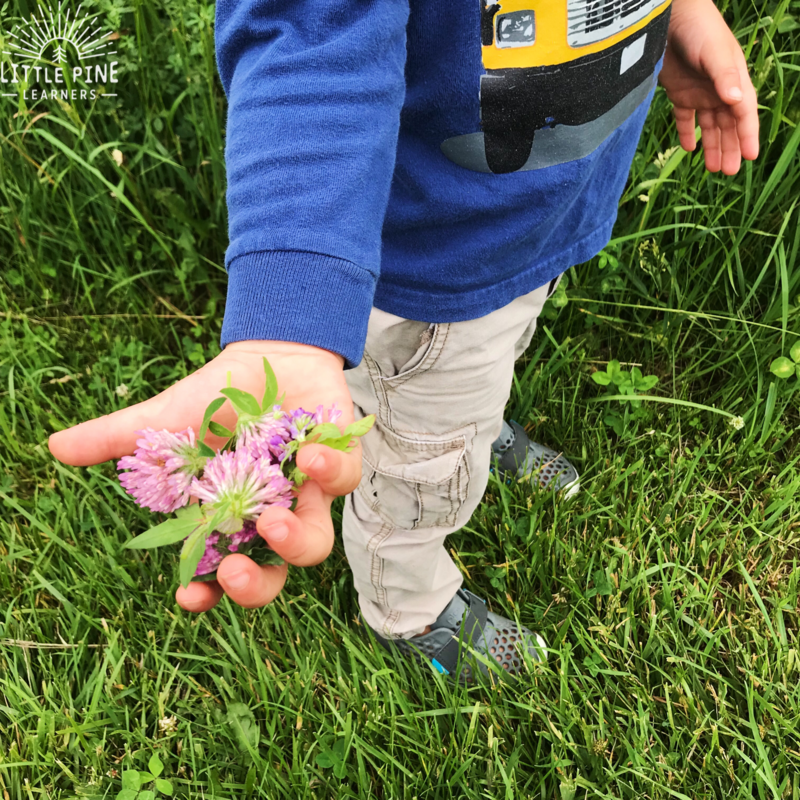 Picking and grabbing pieces of nature, strengthens fine motor skills and helps build those little hand muscles! Sound out the pieces of nature that you find, emphasizing the beginning sounds. 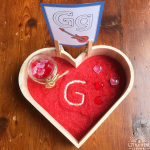 This is such a fun way to practice those beginning phonemic awareness skills! Need more fun?! 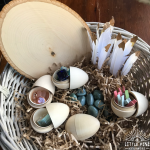 Check out How we Used Story Stones on Earth Day.